Facial aging is a continuous process throughout life. Effects may become noticeable in a person’s 20’s when fine wrinkles, light blemishes, and sun spots begin to appear. Changes in the texture and firmness of skin may also become apparent. As aging progresses, more wrinkles and fine lines appear, and they deepen over time. Your skin continues to change in texture and color, and begins to sag. These processes continue throughout your life. They are a result of the aging of the skin, the reduction in collagen, and the underlying structures such as bones. Facial aging can cause you to think differently about yourself resulting in emotional and psychological changes, causing some people to become depressed and insecure. The cells of the epidermis cover and protect the body. Specialized cells promote continual regeneration of the skin. The epidermis has no blood supply, so its health and appearance depends on nutrients that filter from the epidermis and its blood vessels. The dermis, the middle layer of the skin, contains collagen, nerve endings, blood vessels, and oil and sweat glands. The collagen in the dermis gives structure to the skin, and provides the infrastructure for elastin and hyaluronic acid to be retained. Elastin is responsible for the skin’s elasticity and hyaluronic acid retains moisture. More collagen in the dermis enables more elastin and hyaluroninc acid to be present. The subcutaneous layer, the innermost layer of the skin, is made up mostly of fat which keeps the body warm and absorbs shocks. Beneath the skin are muscle and bones. The facial bones support the muscle and the skin, giving shape and support to the face. Facial muscles attach directly to the skin, unlike in other areas of the body. This results in more movement of the skin as facial muscles move. 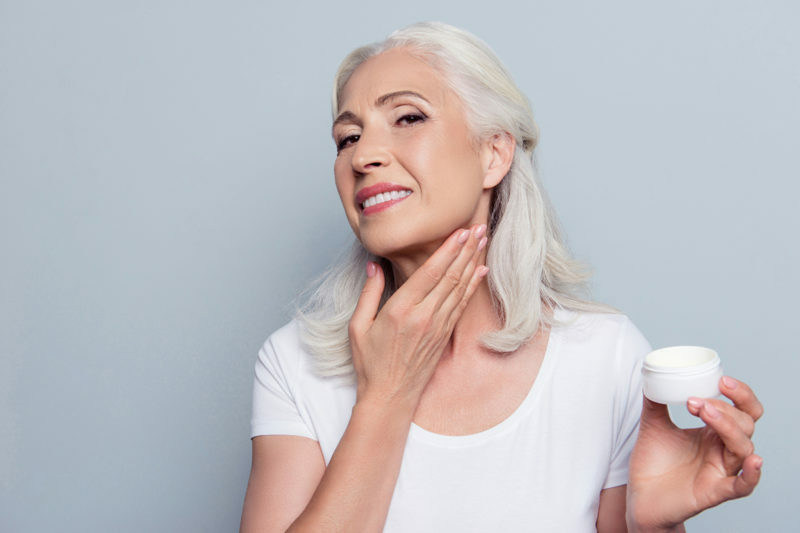 As skin ages the dermis thins due to collagen loss, reducing its ability to retain elasticity (from elastin) and moisture (hyaluronic acid) Elastin is a protein found in connective tissue that is elastic and helps the skin maintain shape. Hyaluronic acid is a substance found in the connective tissue of the body that cushions and lubricates. In addition, over time bone deteriorates, becoming thinner and more brittle. This thinning of the face is called volume loss. This causes your face to appear thinner and results in a weaker looking jaw. Osteoporosis can compound these effects, as the bones thin faster. The face also thins due to fat loss, as well as the movement of fat to other parts of the face. Skin appears looser and sags. The diminished elasticity of the skin reduces it’s ability to retain its shape and it does not conform as closely to the contours of the face. Gravity then pulls on both the skin and the underlying fat, and they move down the face. This results in sagging eyelids, bags under the eyes, and jowls. There are two types of factors in facial aging. : internal (age-related) and external (or environmental). Both factors cause visible and nonvisible effects. Internal factors are those that happen over time and are caused by genetic factors. This breakdown of cellular structures and processes, reduced bone density and hormonal changes. These factors lead to visible effects, such as wrinkles and folds, fine lines, drooping eyelids, hollowed cheeks, jowls and dry skin. Reduction of collagen elastin and hyaluronic acid, fat loss and redistribution, dermal thinning and bone resorption are nonvisible effects. External factors are environmental things that have impact on aging, including sun damage, smoking, facial expressions, sleep positions and gravity. Visible effects of these external factors also include wrinkles and folds, as well as rough skin, blemishes, pigmentation and freckles. The nonvisible effects also include epidermal thickening and dermal thinning. Visible effects are those you can see in the mirror, such as wrinkles, lines, folds, loss of elasticity, sagging skin, skin texture/color changes. The speed at which these changes occur varies depending on environmental factors and genetics. Wrinkles, lines and folds are initially caused by facial expressions. As skin ages, internal changes to the skin, such as collagen loss, result in deeper and more persistent wrinkles, lines, and folds. They are classified by depth as well as by area of the face, and the appropriate treatment depends on these factors. Starting as early as the 20’s, you may start to develop frown lines in the upper face and fine wrinkles and folds in the mid-face. In your 40’s, frown lines in the upper and fine lines, wrinkles, and folds in the mid-face become more defined and may be joined by some lip thinning, hollowing of eyes and cheeks, and jowls. Loss of collagen, fat and water, as well as sun damage and stress in increasing amounts cause this progression of the visible effects of facial aging.